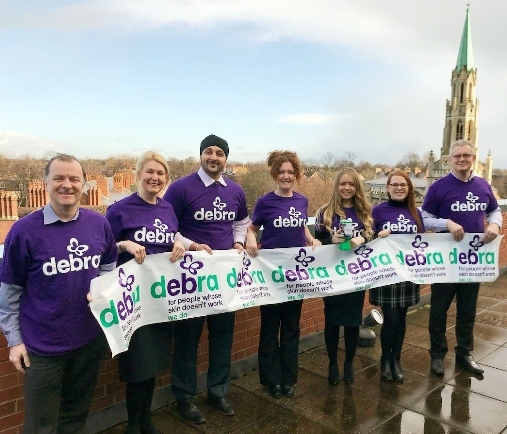 hlw Keeble Hawson’s Doncaster office has voted to adopt DEBRA, the national charity supporting those directly affected by, and working with, Epidermolysis Bullosa (EB), as its charity of choice for 2018. EB is a potentially fatal skin condition that causes constant pain due to unstoppable internal and external blistering. Marking its 40th Anniversary this year, DEBRA funds pioneering research in symptom alleviation and, ultimately, a cure. It also provides much needed care and support to the EB Community including part funding specialist nursing support. hlw Keeble Hawson’s packed fundraising programme includes trainee solicitor, Kate Large, tackling the Hull Inflatable 5k Obstacle Run at Beverley Racecourse in April along with a gruelling Tough mudder challenge, raffles at events – and a monthly dress-down Friday. Money raised through hlw Keeble Hawson’s fundraising programme could help fund research into symptom alleviation and effective treatments for the condition, including clinical trials to investigate whether a drug, Rigosertib, could be used to reduce or destroy cancer tumours caused by EB which have not responded to conventional treatments. Fundraising also supports projects which could make a real difference to the quality of life for people suffering from EB, including part funding specialist EB nursing care, purchasing specialist equipment or enabling people suffering from EB to enjoy a break away in one of DEBRA’s specially adapted holiday homes. hlw Keeble Hawson, which also has offices in Sheffield and Leeds, boosted local charities by almost £11,000 in fundraising and donations during 2017.